Drivers of electric vehicles will now be able to charge their vehicles at one of 210 new lamp column charge points installed around the borough. The project is funded through a £300,000 grant from the Go Ultra Low City Scheme run by the Department for Transport and administered by London Councils, Transport for London and the GLA. £100,000 of match funding has been provided from London Borough of Richmond upon Thames and aims to support those residents without access to off-street parking. The lamp column charge points will be installed by Siemens who have been awarded the contract to deliver this project. The Siemens equipment ties in with leading EV charging provider ubitricity which has already been tried and tested in the borough. Site surveys have been completed and installations have commenced. The charge points will be fully operational by 31st March 2019. The new installations come following requests from residents submitted through the Council’s website. 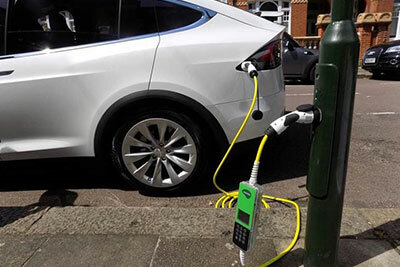 There are now 39 locations in the borough where residents can charge their electric vehicles including Source London charge points and all publicly accessible charge points. “Siemens and ubitricity are working closely to provide people with electric vehicle charging infrastructure which is available at the most convenient location for them to help accelerate the increase in privately owned electric vehicles. We are delighted that Richmond have come together to offer this service for their residents.